Already in the 14th century, the guild of spice traders and spice merchants was established in Basel’s inner city. Since 1902, the Safran zunft is located in the Gerbergasse and offers delicious food in its restaurant. Several historic rooms can be used for your private and business events. Celebrate in the guildhall under the eight meter high vaulted ceiling and enlighten your event with large windows and a fabulous setting. Depending on the seating, you can dine with up to 180 people at round tables or with up to 280 people at long tables. Small business meetings are perfectly accommodated with up to 24 people in the “Vorgesetztenstube”. This room impresses with its oak paneling of the 18th century and beautiful stained-glass windows. If necessary, the “Täferwand” can be unfolded and connected to the “Andreas-Ryffstube”. As a result, conferences and seminars with 60 people can be successfully implemented in these rooms. The cozy “Gilgenstube” offers space for 50 guests at round tables with modern chandeliers and elegant carpet. The foyer is ideal for an aperitif, a lunch buffet or a coffee break. The in-house restaurant in the quaint guild room will spoil you and your conference participants with fresh, seasonal and high quality dishes. Special attention is paid to the purchase of sustainable food which has been produced in an environmentally friendly manner. As well, the kitchen team combines modern and traditional dishes. 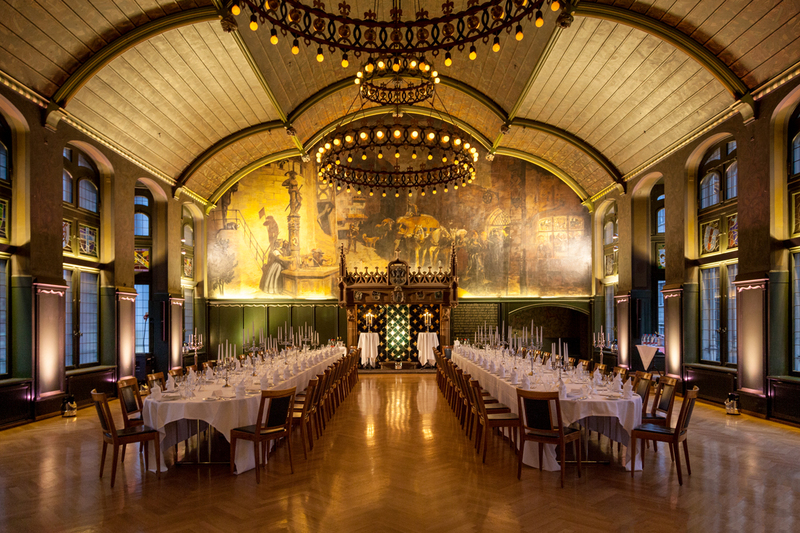 Your wedding party, with up to 280 guests, will find enough space and an elegant ambience in the hall which is one of the most magnificent historic halls of Basel. The historic location also offers several settings for delightful wedding photos with your loved ones. In this location, the most beautiful day in your life will be an unforgettable experience! The experienced event team offers customized weddings packages and supports you during the planning and realization of your celebration at the Safran Zunft. The in-house restaurant will prepare a delicious wedding menu for you and your guests.